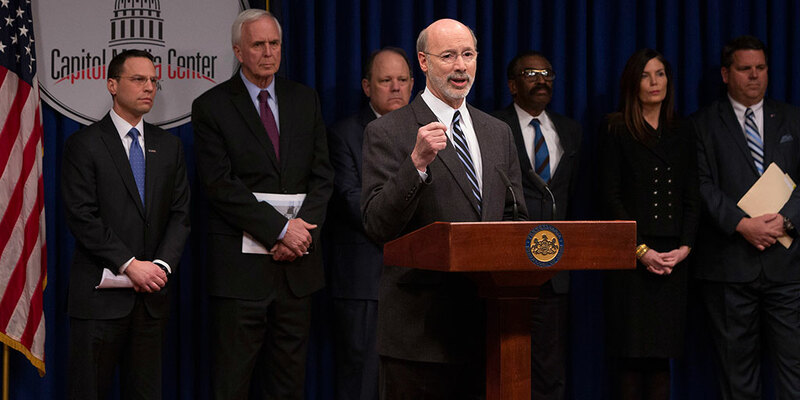 If you’re wondering what changed this week, Governor Wolf took two big steps to change Pennsylvania’s criminal justice system for the better – meaning lower costs for taxpayers, better outcomes for offenders, and less crime in the commonwealth. On Tuesday, Governor Wolf joined sponsors, Sen. Greenleaf (R-Montgomery) and Rep. Harris (D-Philadelphia), and supporters of Senate Bill 166 to sign the legislation into law. SB 166 makes it possible for low-level ex-offenders, who have served their time and not committed any crimes for 7 or 10 years, to ask the court to seal their criminal records, which will help them to get jobs and not return to prison. On Thursday, Governor Wolf joined PCCD Chairman Josh Shapiro, Corrections Secretary John Wetzel, Parole Board Chairman Michael Green, and leaders from both political parties and all three branches of government to launch an extensive review of the state’s criminal justice system as part of a new Justice Reinvestment Initiative designed to reduce ineffective corrections spending and invest those savings in proven public safety strategies. Pennsylvania currently has the highest incarceration rate among all states in the Northeast, despite reducing its prison population in recent years. Between 2004 and 2014, corrections expenditures increased by 40 percent, from $1.5 billion to $2.2 billion. Over the same period, the state’s incarceration rate increased by 20 percent. Conversely, New York and New Jersey saw their incarceration rates drop by 20 percent and 21 percent, respectively.